This is in no way a Best Of List, since I was only able to listen to a fraction of the music that came out last year. The albums are arranged in order of preference. I’d like to extend my gratitude to all the artists, press agents, and labels that sent CDs and downloads. I sincerely apologize that due to time constraints, I wasn’t always able to respond to the messages I received. Note: Some of these albums were actually released in 2015. So, here is the Top 20 of this year’s list. The numbers in parenthesis are the date the review was posted on Broken Hearted Toy. This is in no way a Best Of List, since I was only able to listen to a fraction of the music that came out last year. The albums are shown in order of preference. I’d like to thank all the artists, press agents, and labels that sent me music to review. I sincerely apologize that due to time constraints, I wasn’t always able to respond to messages I received. I wish everyone the best of luck in their creative endeavors. Note: Some of these albums were actually released in 2015. So, here is the second half of this year’s list. The numbers in parenthesis are the date the review was posted on Broken Hearted Toy. 24. Javier Escovedo - Kicked Out Of Eden (1/12) Second solo effort from the leader of 1970s punk band The Zeros had loads of energy and he was backed by a first-rate band. 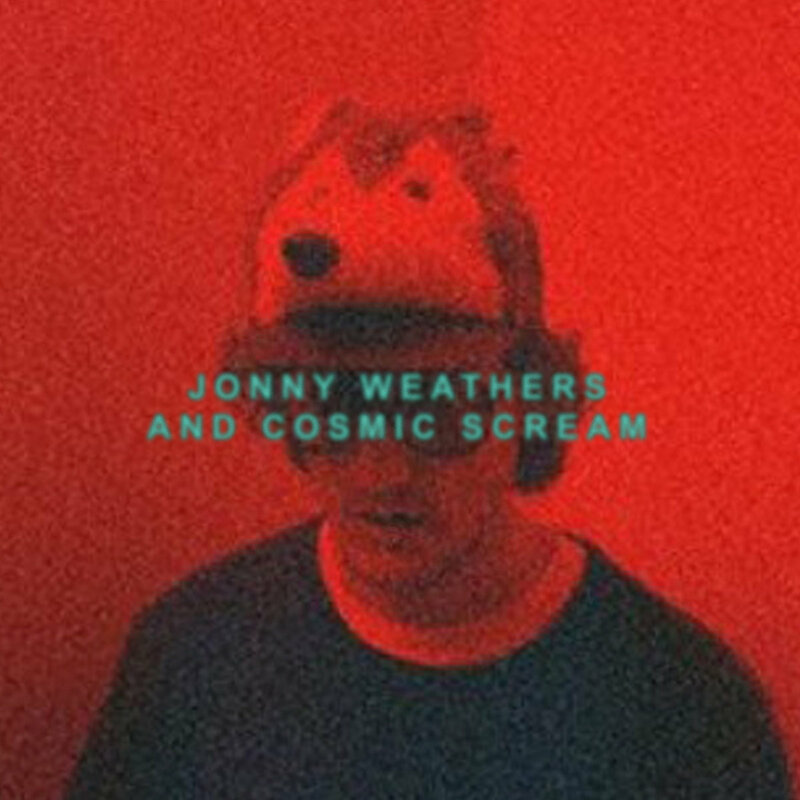 This is the third release from Jonny Weathers, the alter ego of London-based singer/multi-instrumentalist Gareth Proctor. There’s a lot of genre-hopping—much of it rooted in the 1970s—throughout these 10 tracks, and Weathers fuels it with consistently inventive guitar playing. He delivers poetic lyrics laced with arresting imagery in a vocal style that’s both streetwise and emotional. “She woke me up and asked me for my angel dust,” Weathers sings at the start of the funk rock number “Babirusa,” while the acoustic “Indian Rope Tricks,” has lines like, “Feel like I’m picking up the pieces of a broken man.” “Hendrix At The Hacienda,” which doesn’t mention the iconic guitarist at all, sounds like one of those rampaging prog rock songs the indie UK label Fruits de Mer loves to put on its records. “Mongo Shaker” also finds Weathers paying homage to Hendrix. 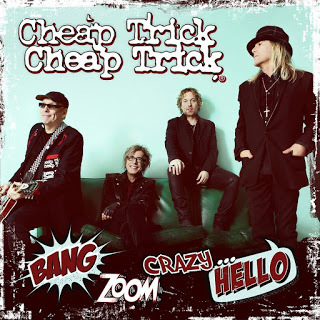 “You’ll Always Be A Planet To Me,” besides having one of the best song titles I’ve heard in a while, combines guitar and keyboards in an off-kilter love song with a classic rock setting. 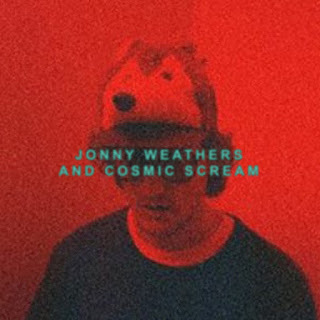 Weathers switches to singer-songwriter mode for “Toxic Pop Soldier,” which features him alone on piano. “The Bullet And The Breeze And The Killing Floor” is another gritty highlight, with Weathers cutting loose an guitar and adding a touch of Rolling Stones with some “hoo hoo” background vocals. 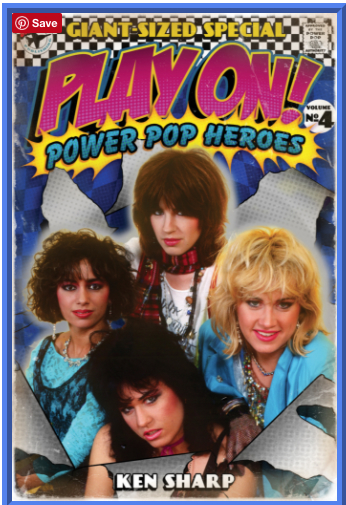 Congratulations to The Bangles on being chosen for the cover of Power Pop Heroes Vol. No. 4, the latest edition in noted rock critic Ken Sharp’s impressive series of books on the genre. 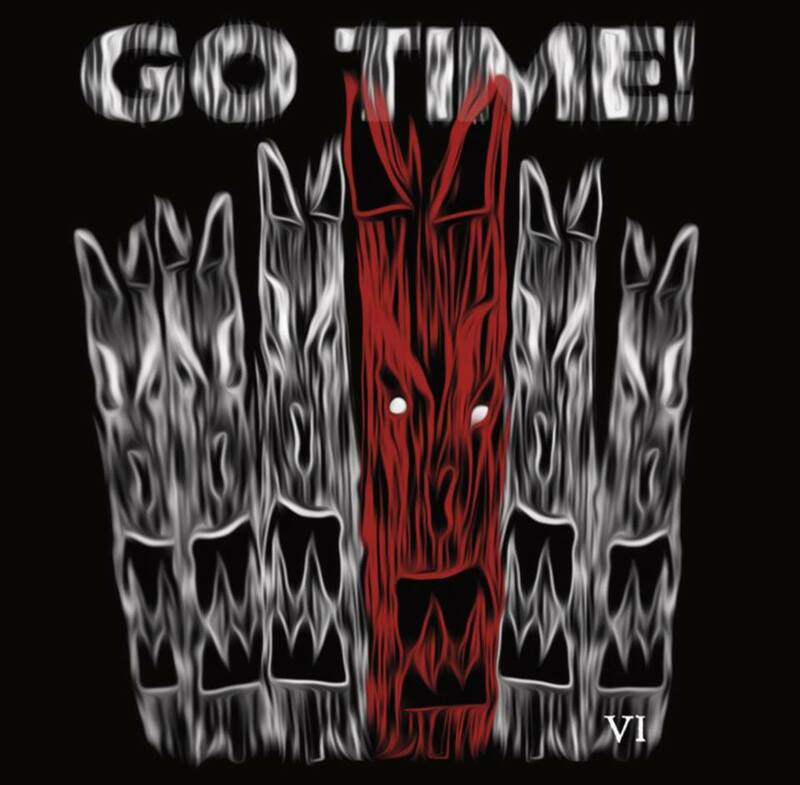 This time out, Sharp casts a spotlight on The dB’s, Tommy Keene, Let’s Active, The Go-Go’s, The Three O’Clock, The Smithereens, Matthew Sweet, The Hoodoo Gurus, and others. Power Pop Heroes Volume No. 4 is available for pre-order from the Pop Geek Heaven website. 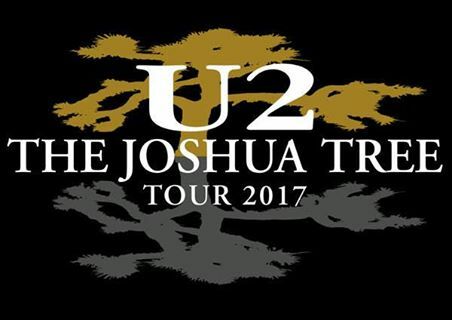 U2 has added a second Chicago date for The Joshua Tree Tour 2017. The iconic Irish band will play June 3 and 4 at Soldier Field and on the following weekend, will be one of the headliners at the Bonnaroo Music And Arts Festival in Manchester, TN. Other acts coming to Bonnaroo include Red Hot Chili Peppers, The Weekend, Tegan and Sara, Lorde, and Cage The Elephant. The Chicago International Puppet Festival has returned to Chicago and will run at various venues around town through next Sunday, January 29. The Chicago Museum of Contemporary Art, Looking Glass Theatre, Links Hall, The Neo-Futurists, and The Center for Community Arts Partnerships at Columbia College are among the local organizations involved. I can’t see the word puppets without immediately thinking of Desiree Burcum of the Famous In The Future comedy group. During the years I was with FIF, and since I left, she’s created a number of imaginative puppets for skits and songs. The Gene Siskel Film Center is presenting an Oscar viewing party titled Hollywood On State: Where You’re The Star! on Sunday, February 26. A live Academy Awards telecast at 7:30 will be preceded by an hour-long session of Red Carpet, Food and Libations. General Admission is $100, and there’s also a $200 VIP Lounge option. Victoria, Victoria, Victoria, Victoria. Ray Davies and The Kinks paid tribute to her in song, and now a one-time companion of The Doctor is portraying Queen Victoria in the early days of her reign. Jenna Coleman, who exuded charm and determination as Clara Oswald on Doctor Who, takes on the lead role in the current PBS Masterpiece series Victoria. The citizens of Aurora, IL will be having a schwinging time when Party On! 25 Years Of Wayne’s World kicks off on February 3 with a poster contest at the If These Walls Could Talk gallery. According to reporter David Sharos in The Beacon News (and picked up by the Chicago Tribune), the month-long celebration honoring the Mike Myers and Dana Carvey flick will also include a major event in Aurora on the 4th of July involving a quest to set a world record for the largest crowd headbanging to Queen’s “Bohemian Rhapsody.” Which hopefully won’t result in numerous cases of whiplash. Way! Ronnie Spector from The Ronettes; solo artist and former member of The Runaways Lita Ford; Garbage vocalist Shirley Manson; and jazz bassist Esperanza Spalding were among the honorees at the fifth annual She Rocks Awards held at the Anaheim Hilton this past Friday night. According to Kelli Skye Fadroski in The Orange County Register, the event was co-hosted by Daisy Rock Girl Guitars founder Tish Ciravolo and Fox 11 news anchor Christine Devine, and featured a rendition of Led Zeppelin’s “Lemon Song” performed by the all-female tribute band Lez Zeppelin. Tickets went on sale today for Aimee Mann’s 18 and over concert on April 29 at Park West. Jonathan Coulton will be her opening act. Mann’s latest album Mental Illness is due out March 31. Other concerts that went on sale today include Green Day and Catfish and The Bottlemen at Wrigley Field on August 24; Jayhawks at Thalia Hall on April 29; and New Pornographers and Waxahatchee at Metro on April 19 and 21. John Cleese of Monty Python's Flying Circus and Fawlty Towers fame, will be on hand at the Chicago Theatre this Sunday afternoon for a screening of Monty Python And The Holy Grail. You can go your own way but you’ll sell more records if you join forces with a former bandmate. The Chicago Tribune recently picked up an article from the L.A. Times by Randall Roberts about the new collaboration from Christine McVie and Lindsey Buckingham. It will be released later this year. Go Time! 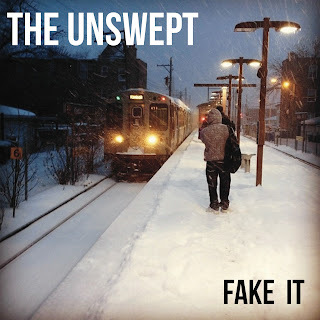 has a record release show for its new 18-track album VI coming up next Saturday, January 28 at The Uptown Lounge. Mama YaYa is the scheduled opened act. Chicago-based alt-rock band whitewolfsonicprincess is hosting its first Rock ’N' Roll Circus event next Sunday, January 29 at The Red Line Tap. Other acts on this eclectic showcase include The Dark Room Men, KC Cronis, and The Hens. Red Eye, the Chicago free paper I’ve often used as a source for entertainment news here on BHT, will stop its daily editions and switch to a Thursday-only issue that will concentrate on dining and entertainment. If that schedule sounds familiar, it’s because it’s the one two of Chicago’s other free papers, The Reader and New City, have used for decades. The Graham Cracker Comics location at 77 E. Madison in downtown Chicago has copies of Resist!, a Brooklyn, NY free newspaper published by Gabe Fowler that features art and comics by numerous women artists, expressing their views on current events. Fowler owns the Brooklyn comic store Desert Island. Artist/critic Robin Dluzen’s solo exhibition Wreath of Roses runs January 23 through February 23 at Harper College in Palatine. Her sculpted and drawing-based pieces comprise industrial and recycled materials and follow the theme of “home.” There will a reception for the artist 12:15 p.m. on Wednesday, February 8. Superior Donuts, the new TV series based on Tracy Letts’ play of the same name, premieres on CBS on February 2. Many Chicagoans still remember the productions staged here featuring Rich Cotovsky of Mary-Arrchie Theatre. Brooklyn-based singer Erin Pellnat has been involved in a variety of projects, including the indie rock band Caretaker. Dream In Color, released late last year, is her collaboration with Christopher Pellnat. He composed the songs, and she successfully chooses a different vocal approach for each of them. The Pellnats (not sure how they’re related) give “Stay” the feel of a traditional folk song that’s been spooking people for centuries. On the surface, it’s a simple invitation from a lonely woman to come in out of the cold, but Christopher’s lines—and Erin’s delivery of them—suggest something more sinister is going on. “I’m the daughter of my mother and at her behest I’ll kiss your tears away,” she explains, and adds that the guest can remain with her in the house until the end of time. 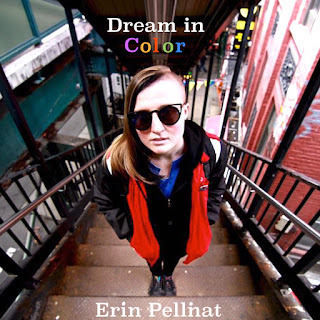 The more optimistic “Dream In Color” is an acoustic-based call to enjoy the world in all its splendor, and suggests, “Love true, truer than you’re used to.” “Forever Kisses,” set to a chic European arrangement, is another tribute to the staying power of love, even when things don’t work as planned. 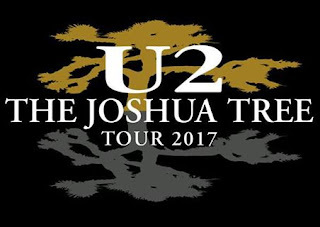 The big news on the Chicago concert front this week was that U2 will be bringing its The Joshua Tree Tour 2017 to Soldier Field on June 3. Tickets go on sale this coming Tuesday. Tickets are already on sale for the Adrian Belew Power Trio on April 1 at the Old Town School of Folk Music; Cheap Trick and Foreigner on August 9 at Huntington Bank Pavilion on Northerly Island; Ides Of March on March 1 at City Winery; Nouvelle Vague, the coed French outfit that transforms punk classics into enticing lounge music, on March 27 at Metro; and John Sebastian on April 9 at SPACE in Evanston. Brandon Jacobs-Jenkins’ Gloria, which was a finalist for a Pulitzer Prize, opens tomorrow at the Goodman Theatre here in Chicago. The Evan Cabnet-directed play concerns “twentysomething editorial assistants” working at one of New York’s most prestigious arts magazines. Take out twentysomething, New York, and prestigious, and that could have been about my life at various times. Sons Of The Silent Age, the impressive, Chicago-based David Bowie tribute band, will be performing his Low album and other songs this Sunday night, January 15, at Metro. The event is part of the 2017 Tomorrow Never Knows festival. Peter Asher: A Musical Memoir Of ‘60s and Beyond takes place this Sunday at The Old Town School Of Folk Music on Chicago’s north side. There’s an all-ages, four-band showcase taking place tomorrow, January 14 from 3:00 to 8 p.m. at 2200 N. California. The Hustle, a quartet that includes vocalist-bassist Ted Ansani from Material Issue and Material Reissue, is hosting the event. The other acts performing are The Ex Okays, The Safes (whose CDs have been favorably reviewed her on BHT), and The Differents. Admission is $8. For a while, it looked scheduling problems would keep the Chicago Cubs from visiting the White House while fellow Chicagoan Barack Obama is still in Office. All that appears to have been straightened out, so Cubs manager Joe Madden will bring his World Series champions to meet the president this Monday. Congratulations to the Cubs on so charismatically brushing aside a century of baseball frustration, and congratulations to Mr. Obama for eight years of effective, compassionate, and classy leadership. WXRT air personalities Lin Brehmer and Marty Lennartz will team up for a live broadcast from The Chicago Cubs Convention tomorrow afternoon from noon to 4:00 p.m. Brehmer and Lennartz, who are longtime Cubs fans, will welcome Joe Maddon, National League MVP Kris Bryant, Ryne Sandburg, and Justin Grimm, along with broadcaster Len Kasper and Cubs executive Crane Kenney. Also on WXRT, overnight DJ Emma Mac kicks off her new show Deep Digs At Dawn show from 6:30 to 8:00 a.m. Looking ahead: Tomorrow The Moon opens for the Boston-based InAeona trio on February 24 at Live Wire. Psychedelic Saturday takes place the next day at Live Wire, with hosts The Red Plastic Buddha, along with Diagonal, Lord Stanley, and Duende. 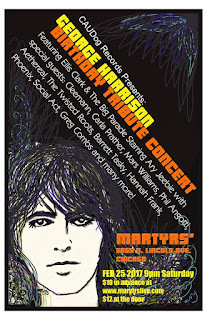 The George Harrison Birthday Tribute Concert, hosted by Ellis Clark and The Big Parade featuring Ary Paloma Jeebie takes place at Martyrs’ on February 25. Special guests include Mars Williams from The Psychedelic Furs, Carla Prather of Poi Dog Pondering, Phil Angotti, The Handcuffs, Aethereal, Social Act, The Polkaholics and Gunnar Cleermann. Walk like a comedian. Singer-guitarist Susanna Hoffs of The Bangles will be going for laughs this Sunday when she joins Tamara Yajia and Petra Hayden as part of the 16th Annual SF Sketch Fest in San Francisco. Happy Birthday to Gary Klebe of Shoes. I interviewed the iconic power pop band on two occasions for the Illinois Entertainer, and Klebe, along with Jeff and John Murphy, was friendly and very informative. The Experience Hendrix all-star tribute to the legendary guitarist comes to the Chicago Theatre on March 25. Performers include Billy Cox, Buddy Guy, Zakk Wylde, Johnny Lang, Kenny Wayne Shepherd, Dweezil Zappa, and others. George Takei, still one of the most popular actors from the original Star Trek, will be at the Chicago Theatre on February 4. Look for Takei to reminisce about his role as Mr. Sulu, and offer some insightful social commentary. The flick Star Trek II: The Wrath Of Khan will be screened as part of the show. 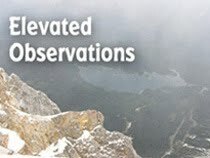 I still plan to do my annual Big Ideas post, in which I solicit contributions and come up with my own suggestions for what creative types hope to or should accomplish in the coming year. Anyone who’d like to participate can send me a short message with your plan via brokenheartedly@gmail.com. Since I’m so late in starting this, I’ll be accepting contributions through the end of January. Go Time! gives listeners an earful on its new IV album via 18 hard-hitting power pop tracks. As the title suggests, this is the sixth release from the Chicago-based band, following 2015’s Ratsel. These latest songs carry on the Go Time! tradition of matching lead vocalist-guitarist Scott Niekelski’s distinctive, almost talky delivery to consistently inventive arrangements. Go Time! has a record release show for IV coming up in January 28 at the Uptown Lounge. 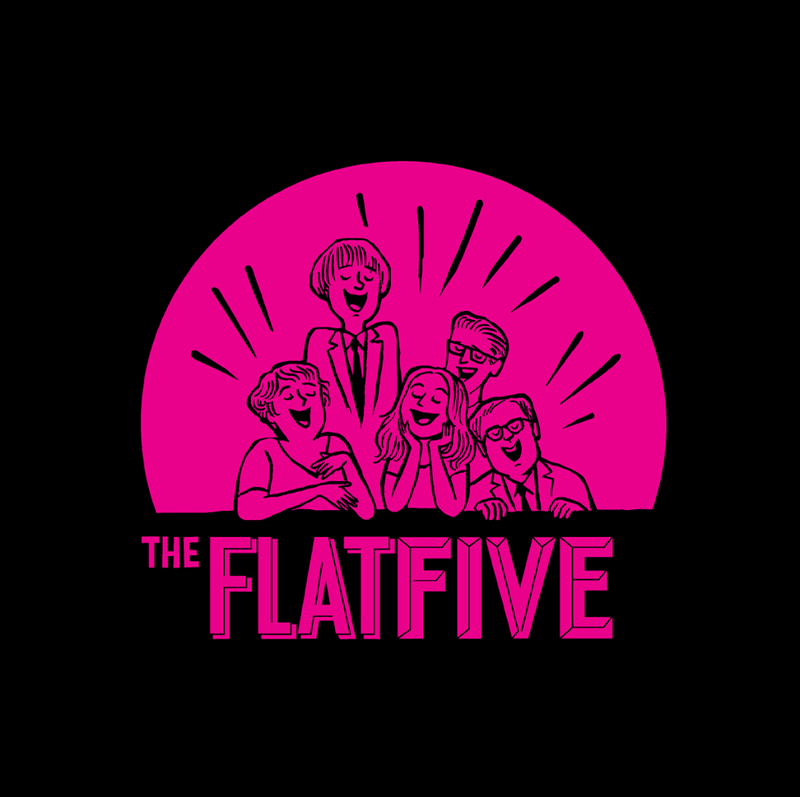 All the members of The Flat Five have busy schedules in the music scene, which might explain why this full-length debut has been a long time coming. 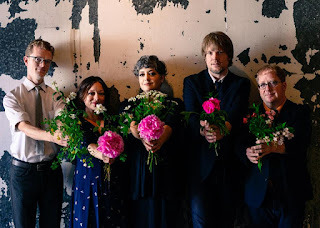 Kelly Hogan, Nora O’Connor, Scott Ligon, Casey McDonough, and Alex Hall formed the band as a means to utilize their impressive harmonies in Chicago area clubs, and have steadily built a loyal following. 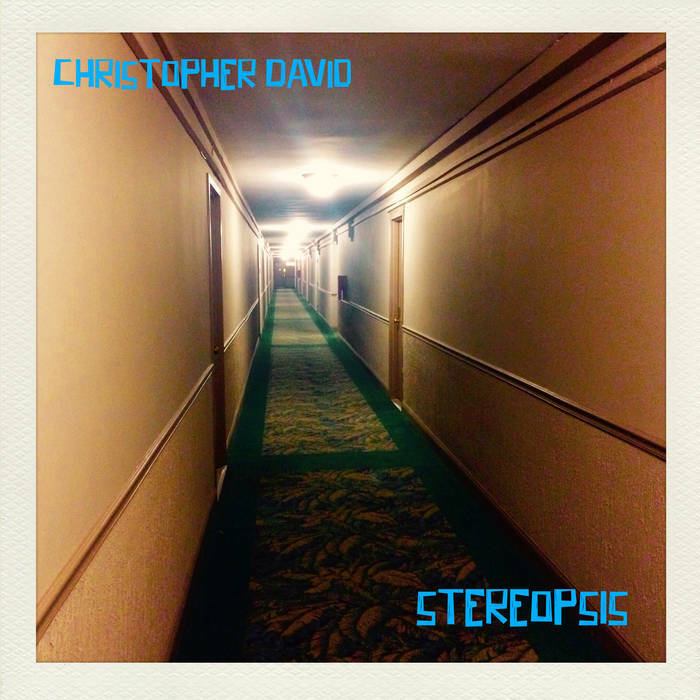 While initially known for eclectic cover versions, they found a kindred soul in Scott Ligon’s songwriter brother Chris. All 12 tracks on It’s A World Of Love And Hope are his compositions. 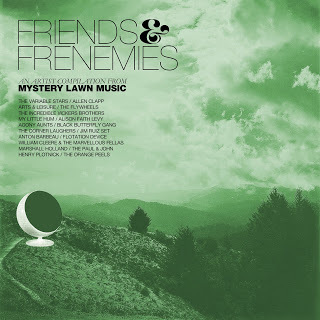 Occasionally, the humor and quick rhymes feel forced, as on “Blue Kazoo,” but that’s easy to overlook when the album offers treats like the jazzy and sensual “You’re Still Joe” and the off-kilter but enticing techno pop of “Almond Grove.” The easy-going “Florida” taps into The Andrews Sisters, but fans of the more recent sibling act The Roches would also be impressed. 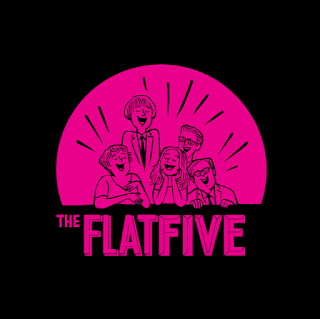 The Flat Five are at their best on “This Is Your Night,” an irresistible samba that recalls “Mas Que Nada” by Sergio Mendes and Brazil 66. In the event of something happening tonight. Sorry for the late notice, but I only just saw the ad in this weeks’s Reader, and now it’s sold out. Tributosaurus, the Chicago-based collective that meticulously recreates famous music artists, will become The Bee Gees tonight at Martyrs’ on Lincoln Avenue. Hopefully, they’ll cover a lot of vintage brothers Gibb stuff and not just the Saturday Night Fever era hits. The show starts at 8:00 p.m.
Give me hope, help me cope, give me Chicago-area bands celebrating George Harrison’s life. Plenty of advance notice on this one: Ellis Clark and The Big Parade featuring Ary Paloma Jeebie will be hosting a a George Harrison Birthday Tribute Concert on February 25 at Martyrs’. Special guests so far include Mars Williams from The Psychedelic Furs, Carla Prather from Poi Dog Pondering, Phil Angotti, The Handcuffs, Aethereal, Social Act, The Polkaholics and Gunnar Cleermann all the way from Denmark. Admission is $10 in advance, $12 at the door. I’ve gotta get a message to you. The Bangles are promising to provide plenty of information to fans who sign up for the band’s new mailing list. Details and a link can be found on The Bangles Facebook page. Yes, Sir! 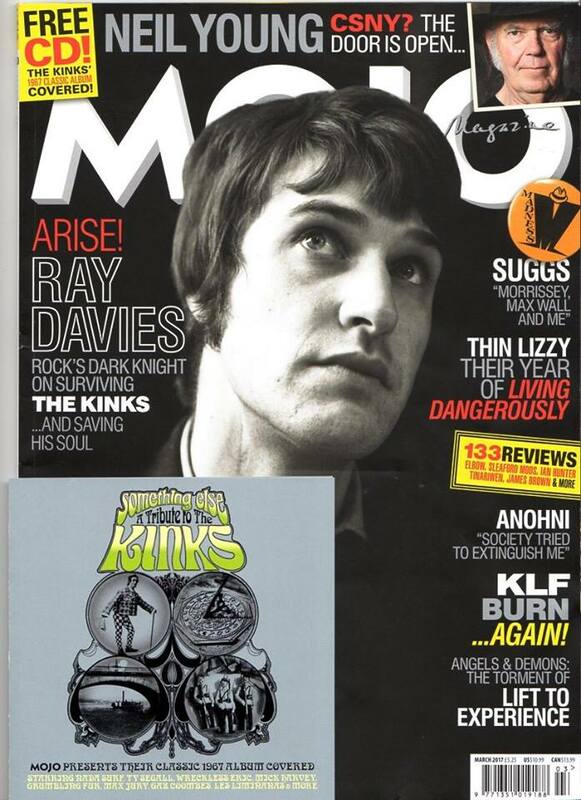 Congratulations to Ray Davies of The Kinks on receiving knighthood from Queen Elizabeth as part of her annual New Year Honors list. According to a report by Daniel Kreps on Rolling Stone online, Davies was rewarded for his service to the arts. The Telepaths, the garage rock outfit that includes James Moeller from whitewolfsonicprincess will be performing tomorrow night at Phyllis’ Musical Inn on Division. Steve Gilpin And Crown Vic Royal are also on the bill. The music starts at 9:45 p.m.
Best wishes to veteran news anchor Kathy Voltmer, who is is leaving her position at WDRV The Drive to explore new adventures. I’m most familiar with Voltmer from her days of working with morning air personality Lin Brehmer on WXRT, but she has many devoted followers from her time at The Drive and other Chicago radio outlets. Tickets are now on sale for The Wild Honey Orchestra Plays The Band’s Music From Big Pink, The Band And Beyond at Alex Theatre in Glendale, CA on March 25. The event’s Facebook page promises very special guests will be announced soon and if past Wild Honey shows are any indication, expect a lot of well-known musicians from the California area. Go Time! has a record release show coming up on January 28 at The Uptown Lounge. Mama YaYa is the scheduled opened act. 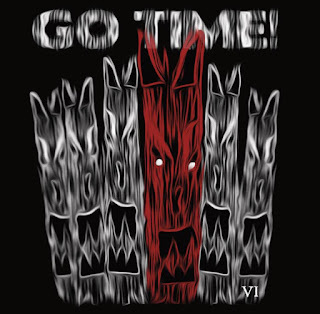 I’m currently in the process of listening to the new Go Time! album VI for a review on Broken Hearted Toy, and it’s an 18-track collection of hard-edged pop led by lead vocalist Scott Niekelski’s distinct delivery. Have you seen you wife, Mr. J? There was an unexpected reference to Mick Jagger’s former spouse Bianca in a recent Chicago Sun-Times article on Bob Herguth’s new book Genuflections: Famous Folks Talk About Growing Up Catholic. The Bianca Jagger Human Rights Foundation is devoted to defending human rights and ending violence toward women and girls. Little known fact: Herguth once did a profile on me for the Sun-Times back in the days when I was a matchbook proofreader and performed with the Famous In The Future comedy group. There’s an all-ages four-band showcase taking place next Saturday, January 14 from 3:00 to 8 p.m. at 2200 N. California. The Hustle, a quartet that includes vocalist-bassist Ted Ansani from Material Issue and Material Reissue, is hosting the event. The other acts performing are The Ex Okays, The Safes (whose CDs have been favorably reviewed her on BHT), and The Differents. Admission is $8. Sons Of The Silent Age, the Chicago-based David Bowie tribute band, will be performing Bowie’s Low album and other songs next Sunday, January 15 at Metro. The event is part of the 2017 Tomorrow Never Knows festival. Chicago-based alt-rock band whitewolfsonicprincess is hosting its first Rock ’N’ Roll Circus event on January 29 at The Red Line Tap. Other acts on this eclectic showcase include The Dark Room Men, KC Cronis, and The Hens. Carla Hayden and James Moeller of whitewolfsonicprincess plan to stage The Rock ’N’ Roll Circus (which takes its name from a famous happening led by The Rolling Stones in 1968) on a semi-regular basis, and are looking for all sorts of creative types to participate. Anyone interested can contact them via the new whitewolfsonicprincess website. Steep Theatre Company will perform Earthquakes In London, Mike Bartlett’s play about a climate scientist and his three daughters coping with global destruction, at its location on Berwyn Avenue starting January 26. Jonathan Berry directs a cast of 15 actors. Peter Asher: A Musical Memoir Of ‘60s and Beyond takes place next Sunday, January 15 at The Old Town School Of Folk Music on Chicago’s north side. Art work from The Flat Five Facebook page. An eclectic triple bill of rock will be getting an early start this Friday night at Reggie’s Music Joint in the south Loop on State Street. The three acts involved are the hard rock quartet Moontower, The Handcuffs, the coed indie band led by singer-guitarist Chloe F. Orwell and drummer Brad Elvis; and Statues Of Liberty, a 10-piece band that describes its music as full-on, full tilt boogie. I’ve covered The Handcuffs’ albums and live shows several times here on Broken Hearted Toy. Showtime is 8:30. That’s also the same night The Flat Five has a sold out show at City Winery. Regarded as an all-star band due to the extensive experience members Kelly Hogan, Nora O’Connor, Scott Ligon, Casey McDonough, and Alex Hall have on the Chicago and national scene, The Flat Five puts a major emphasis on harmony vocals while creating original tunes that sound like that they could have sprung up decades ago. They’ve been getting a lot of press and rave reviews for their long-awaited debut effort It’s A World Of Love And Hope. For the City Winery gig, The Flat Five will be joined by Chicago’s Total Pro Horns. 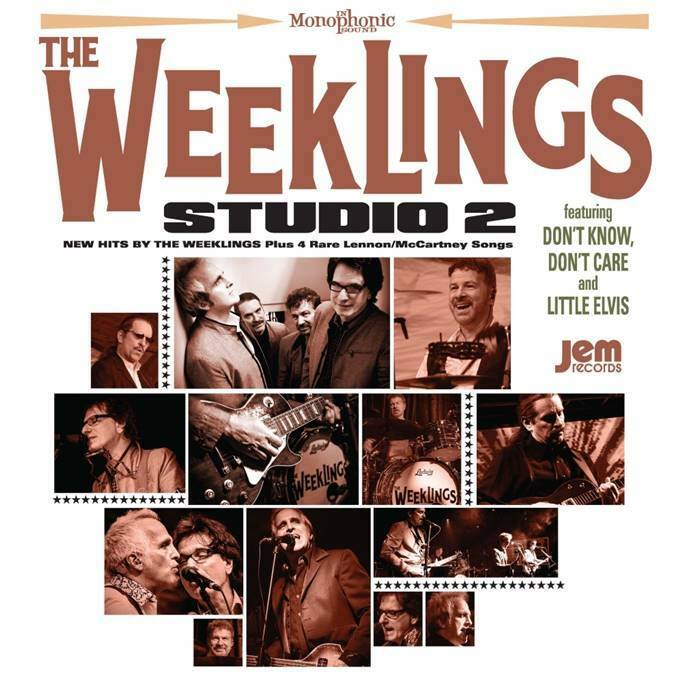 It’s no surprise The Weeklings continue to draw from The Beatles on this second effort since vocalist-bassist Glen Burtnik and vocalist-guitarist John Merjave are also members of the popular Beatles tribute band Liverpool. As with their debut Monophonic, The Weeklings mix original tunes with vintage rarities The Beatles composed but never officially released. This time out though, the emphasis is on songs Burtnik composed with vocalist-keyboards player Bob Burger, with only a third coming from Lennon and McCartney. The band also has a new drummer now that Joe Bellia has replaced Dave Anthony. Sporting a cover that mimics the Second Album by The Beatles,’ Studio 2 features short, peppy tracks that were recorded at London’s Abbey Road Studios. On “Morning, Noon And Night,” The Weaklings adroitly tap into the British Invasion, right down to the harmonica playing. “You’re The One,” the only Burtnik-Merjave composition, and “Little Elvis” have a touch of rock-a-billy, while the inspired vocal interplay on “Don’t Know, Don’t Care” comes across like The Hollies covering a Chuck Berry tune. “You Must Write” shows these guys still know how to go treasure hunting in the Beatles catalog, and Burtnik’s loping bass is particularly impressive. The exquisite harmonies on “Because I Know You Love Me So” underscore Lennon and McCartney’s fascination with The Everly Brothers, while the rollicking “Some Days” is an irresistible look back at the English lads’ childhood days. “Loved Of The Loved,” like The Weeklings’ own “Love Can,” is almost too pretty and polished, but overall, Studio 2 is another round of Anglo-flavored fun.